Lisa Winberg, Director of English Learners and Categorical Programs at 951-765-5100 ext 3015. This program provides financial assistance to school districts (LEAs) and schools with high numbers or high percentages of poor children to help ensure that all children meet challenging state academic standards. In the Hemet Unified School District, schools are designated either Targeted Assistance or Schoolwide. A targeted assistance school is so-termed because it targets its services on specific, identified children. A student is eligible to receive Title I services if the school identifies the student as failing or most at risk of failing to meet the state’s academic achievement standards. Children selected most often receive intensive instruction in a pull-out service model. They are also encouraged to attend before school or after school sessions to extend their instructional day. In a Schoolwide Program (SWP), most federal, state, and local funds are consolidated to upgrade the entire educational program of the school. In schools operating on the schoolwide model, Title I is no longer a distinct program but is integrated into the regular program. The purpose of Title II, Part A is to increase the academic achievement of all students by helping schools and districts improve teacher and principal quality and ensure that all teachers are highly qualified. In exchange for receiving these funds, these agencies are held accountable for improvements in academic achievement. Title III - Limited English Proficient (LEP) Student Program is to ensure that all limited-English proficient (LEP) students, referred to as English learners in California, attain English proficiency, develop high levels of academic attainment in English, and meet the same challenging state academic standards as all other students. To support this goal, the United States Department of Education (USDE) allocates Title III funds to state educational agencies, such as the California Department of Education (CDE), to provide subgrants to eligible local educational agencies based on the number of LEP students enrolled. Title III - Immigrant Education Program funds are to be specifically targeted to eligible immigrant students and their families through the provision of supplementary programs and services for the underlying purpose of assuring that these students meet the same challenging grade level and graduation standards as mainstream students. Title IV, Part A, Safe and Drug-Free Schools and Communities is a federal categorical program. It provides funding to develop, implement, and evaluate comprehensive drug/alcohol, tobacco, and violence prevention programs and activities, which are consistent with the principles of effectiveness and that are coordinated with school and community-based program services. The goal is to foster a safe and drug-free learning environment that supports academic achievement. 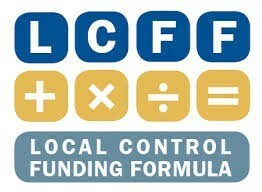 Replaces the current state model of funding with a more streamlined formula and removes most existing spending restrictions. Collapses over 20 categorical programs (funds earmarked by the state for different types of uses with spending restrictions). However, some categorical programs remain, including special education, after school programs, school lunches, transportation and TIIG (Targeted Instructional Improvement Grant). Shifts decision-making to the school district level with flexibility for local communities to decide how to best spend resources. Requires that districts must use supplemental and concentration funds to "increase or improve services for EL/LI pupils." Requires districts to adopt Local Control and Accountability Plans (LCAPs) that show how funds will be spent to provide high-quality educational programs and improve student outcomes.